The petition says a “second Brexit referendum may not happen – so vote now”. MORE THAN TWO million people have signed an online petition calling for the British government to cancel Brexit by revoking Article 50. The petition, which was launched yesterday, says a “second Brexit referendum may not happen – so vote now”. “The government repeatedly claims exiting the EU is ‘the will of the people’. We need to put a stop to this claim by proving the strength of public support now, for remaining in the EU. A People’s Vote may not happen – so vote now,” it reads. At the time of updating this article, the petition had just over 2,002,343 signatures. It was started by Margaret Anne Georgiadou, who told the BBC: “I became like every other Remainer – very frustrated that we’ve been silenced and ignored for so long. So I think now it’s almost like a dam bursting, because we’ve been held back in a sense – it’s almost like last chance saloon now. She said the petition “didn’t do very well for a week”. “I nearly gave up but then I contacted a lot of people and it took off,” she added. The British Parliament’s petitions committee tweeted that the rate of signings is the “highest the site has ever had to deal with”, after the website briefly crashed earlier. The petition comes as the European Council agreed to delay the date by which the UK leaves the European Union by almost two months if the Withdrawal Agreement is passed by the UK parliament next week. Following lengthy discussions in Brussels, the European Council has now agreed to an extension until 22 May 2019, provided the Withdrawal Agreement is approved by the House of Commons next week. If the Withdrawal Agreement is not approved by the House of Commons next week, the European Council agrees to an extension until 12 April 2019 and “expects the United Kingdom to indicate a way forward before this date for consideration by the European Council”. The UK had been legally obliged to leave the European Union on 29 March (next Friday), two years to the day after Article 50 was triggered by Theresa May, which sets the Brexit process in motion. If a petition on the website gets more than 100,000 signatures, the Parliament is meant to consider it for debate. The government is expected to respond to all petitions that get more than 10,000 signatures. Data on the website shows the petition’s strongest pockets of support are in north London, Bristol and Brighton – all Remain hotbeds during the 2016 referendum. There were also strong pockets of support in countries with large British diasporas, including more than 8,000 from France and more than 4,000 from Spain. It is the third most popular e-petition since parliament launched the website in 2011. A 2016 petition calling for a second EU referendum should the winning vote and turnout not reach a certain threshold received the most signatories at almost 4.2 million. A petition to prevent US President Donald Trump from making a state visit to Britain reached 1.9 million signatures. Email “Over 2 million people sign petition on Parliament website to revoke Article 50”. 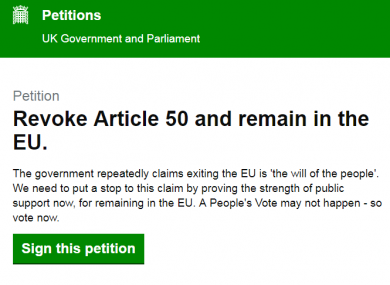 Feedback on “Over 2 million people sign petition on Parliament website to revoke Article 50”.